tower being larger with a water cistern and a room covered by a cross vault. 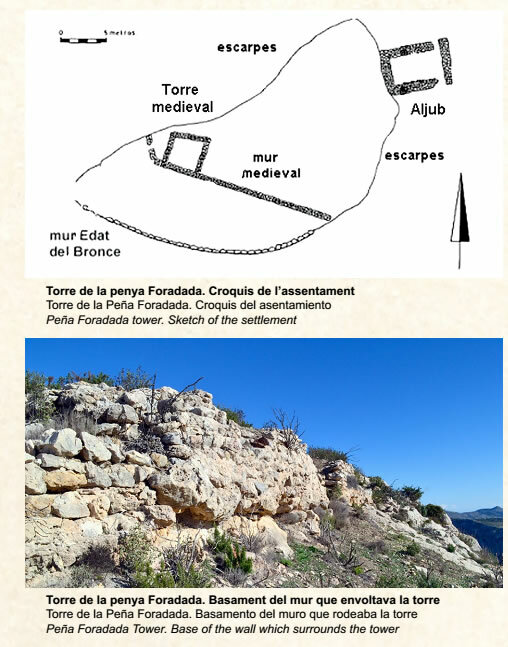 Judging from the remains, this larger tower was originally a military or refuge watchtower (atalaya) during Almohad Islamic times (12th -13th centuries). The village of Forna was taken by King Jaume I from the Muslims in 1258, but the first record of the castle was not until the middle of the 14th century and its extension and conversion into the feudal residencial palace we see today seems to have occurred in the middle of the 15th century when the village was owned by the Cruilles family. 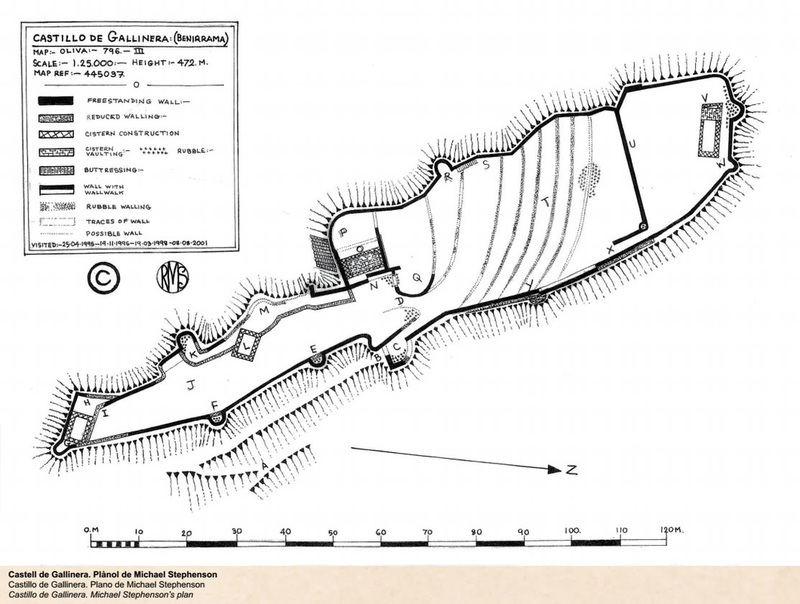 The castle was excavated in 1981, revealing ceramics from the 14th to 16th centuries. In 2003 it was extensively restored by the Adsubia/Forna Town Hall with technical assistance from the MARQ (Provincial Archaeological Museum of Alicante). The four walls have few openings, and the towers are independent from each other architecturally. The entrance is a door in the north wall framed by a pointed arch. 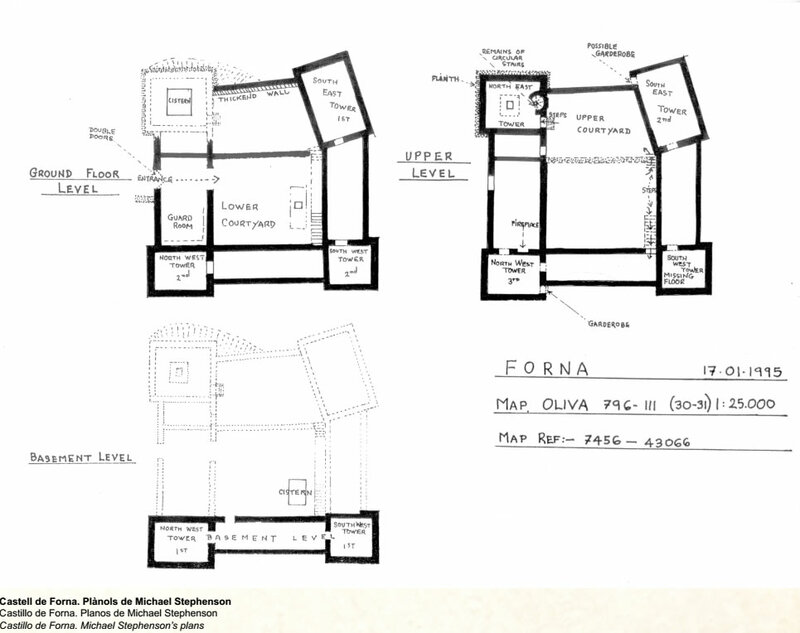 Inside there is a large courtyard with the main water cistern in the centre and staircase leading to the upper floor. There are various chambers around the courtyard. On the ground floor there are stables, kitchen, dining room and a spacious room with large windows which faces the patio and gives a view of the bedrooms upstairs. Of particular note is a set of late medieval / renaissance graffiti drawings on the wall of a room (the prison) in the northwest tower. These depict sailing boats, a sea serpent, armed fighters, and animal motifs. This is one of the best sets of such drawings in Alicante province. 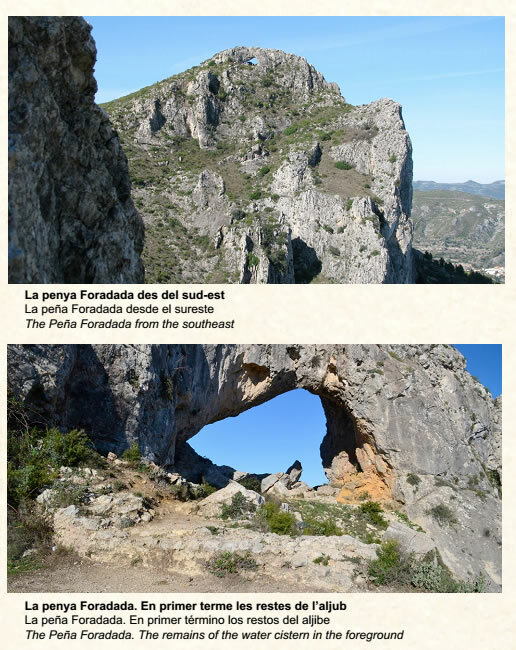 The Gallinera (Benirrama) castle is located on top of a rocky promontory (470m) overlooking the lower (seaward) entrance to the Vall de Gallinera. 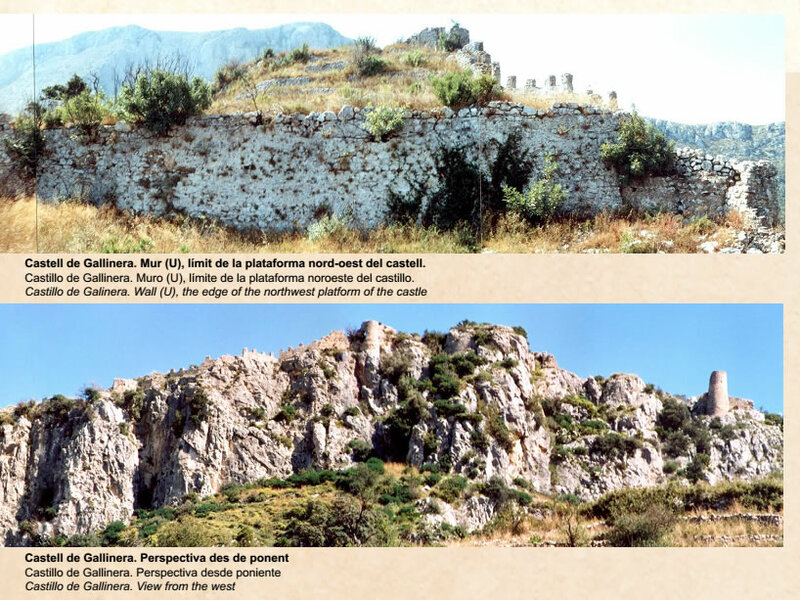 It lies beneath the peak of Almiserà upon which the 10th century Islamic fort of Xillibre is located. The castle is also Islamic in origin, but the date of its foundation is unclear. Although 11th century ceramics have been found nearby, excavations of the castle carried out in 1981 found materials dated no earlier than 12th century. The first historical record is even later, in the 1245 "Treaty of the Well". 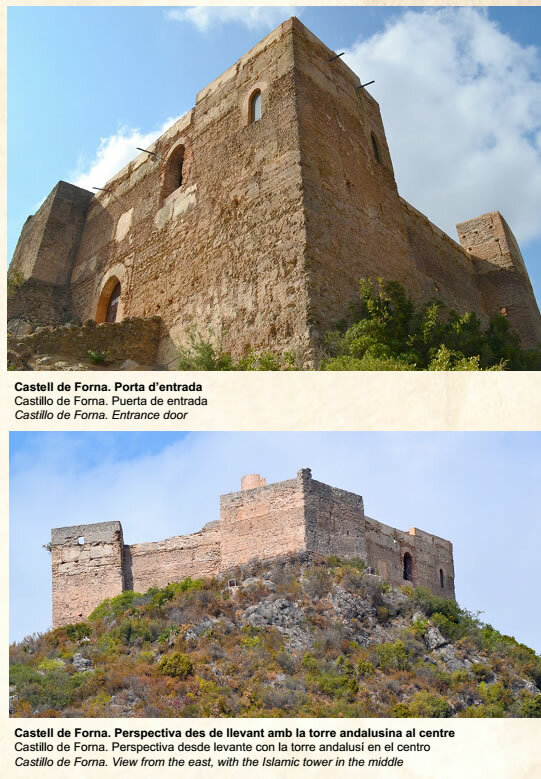 Perhaps surprisingly, the castle appears to have been associated with the village and farmlands of Vall d'Ebo as well as farmsteads in the Vall de Gallinera. According to the treaty, the Moslem lord Al Azraq agreed to hand it over to King Jaume I after a three year period, but failed to keep his promise and it was finally taken by King Jaume in 1258. Today, nothing remains of the original castle which was destroyed by the powerful earthquake of 1396. The ruins we see today are the result of a 14th - 15th century rebuilding. Another earthquake in 1644 led to the castle's abandonment. ​The ruins are in two sections. The foundations of a square tower, made of stones and mortar, lie behind and above the rock arch. This is connected to a low wall of solid mortar. At the foot of the arch are the remains of a square water cistern. Islamic in origin, dating from no earlier than the 11th century. There are no early written records of the site and no medieval Christian ceramics have been found, suggesting its abandonment during or before the 13th century Christian reconquest.